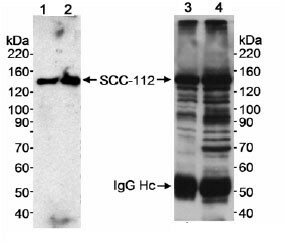 The immunogen is within the region between residues 1150 and 1200 of human SCC-112. Our Abpromise guarantee covers the use of ab17960 in the following tested applications. WB Use a concentration of 0.1 µg/ml. Detects a band of approximately 150 kDa (predicted molecular weight: 150 kDa). Probable regulator of sister chromatid cohesion in mitosis which may stabilize cohesin complex association with chromatin. May couple sister chromatid cohesion during mitosis to DNA replication. Cohesion ensures that chromosome partitioning is accurate in both meiotic and mitotic cells and plays an important role in DNA repair. Highest level in colon. Low levels in lung, ovary, breast and kidney. Reduced level in renal tumor tissue. Isoform 2 is expressed in kidney. Belongs to the PDS5 family. Cell cycle-regulated with highest level in G2 phase. Nucleus. Associated with chromatin through most of the cell cycle. Dissociates from chromatin in late prophase, reassociates during late telophase. Western blot and IP using ab17960 at 0.1µg/ml for Western blot and at 2µg/ml for IP. 5 to 20µg of nuclear extract (NE) from HeLa cell lysate were used for WB. 1 mg of nuclear extract (NE) from HeLa cell lysate were used for IP. Detection: Chemiluminescence with an exposure time of less than 5 minutes. Publishing research using ab17960? Please let us know so that we can cite the reference in this datasheet. There are currently no Customer reviews or Questions for ab17960.